Well, we are nearing the end of summer and I have to say that my feet are looking and feeling much better these days. If you remember several months ago I was posting about how cracked and dry my feet have been and I was on the verge of seeing a podiatrist. After trying several creams and products, my feet have been so much better. I do have to keep up with my foot care because I LOVE to wear my sandals and if you wear flip flops or sandals, then you know how dry your feet can get. Enjoy soft, silky feet with the Sof'feet™ Footcare System. Created by a Dermatologist, the Sof'feet Footcare System combines an effective callus reducer with a rich softening cream to help your feet stay their softest. The Sof'feet Footcare System is used all over the world as a highly effective treatment for rough and callused feet. Carried by most major beauty supply stores and found in the finest salons this system has everything you need to keep your feet looking young, healthy, and soft. I don't know about you but when it comes to my feet, I want to take the best of care of them. They take such a beating, especially during the summer months when they are exposed to sun and dry air. I was very excited when my kit arrived and I am going to show you how it works today! So, for this review I was sent a Sof'feet Footcare System intro kit. This kit contains a callus reducer tool, 2 replacement screens and a two ounce container of softening cream. I have to admit that I was a bit intimidated by the callus reducer tool as it looked like it would hurt. But when I thought about it, my foot skin is VERY tough so it probably wouldn't hurt at all. This tool has a plastic handle and the screen is easily removed by twisting the small thumbscrew on the top of the tool, which will release the screen. Using the callus reducer is simple. I put a dry, clean towel under the foot I would be working on and began to rub the rough part of my heel. (By the way, it is recommended that you do this before showering or bathing and before applying creams or lotions.) It felt really nice and just seemed to glide over my feet...there was no pain at all! I know that when I use a pumice stone my feet get sore and start to feel hot from the friction; I felt none of that with this tool. When the mesh screen becomes full of dry skin, just tap it out on your towel and you are ready to go again! You can see how well it worked for me and this was just after several seconds of using it! Needless to say, I am impressed. My feet felt soooo soft and the rough edges were completely smoothed down. The softening cream is amazing as well. It is thick, rich and non-greasy which means you can also use it on your elbows, hands and knees as well. The formulation helps to keep your feet soft, smooth and supple...especially after using the callus reducer. I applied this cream to my feet after working on them and it felt sooooooooooo good. It is really hard to describe the wonderful difference I noticed in my feet immediately. The Sof'feet Footcare System retails for $21.00 for the intro kit (includes everything I received) and you can also purchase the items separately...including replacement screens. Right now, Sof'feet is offering a coupon code for $5.00 off a purchase from their website of $20 or more. All you do is enter this code: Soffeet5. So, in my opinion...Sof'feet is an AMAZING product! I am just loving the way my feet look and feel so soft. 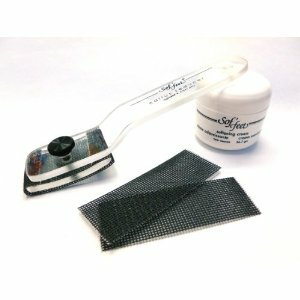 The callus reducer tool is very effective and painless to use and the softening cream is soo great. I would definitely and whole-heartily recommend this company to anyone looking to get gorgeous and soft feet with little effort. Truly an affordable and rewarding product! Disclaimer: I received no monetary compensation for this post. I did receive free Sof'feet products for review purposes. All quotes and stock photos are from the Sof'feet website and email. Prize is being provided and shipped by the sponsor. All thoughts and opinions are 100% mine. I want to win because my feet are so dry and cracked, all year round. I want to win this to help my dry heels. I'd love to win so I won't feel so bad about my heels when I wear flip flops. My feet need this Bad. I have very dry feet and rough spots so this product could help a lot. I want to win because I have some really thick calluses on my feet. I want to win because I'm very picky about my feet and want to keep them smooth as much as I can but they tend to stay cracked and rough! I want to win because my feel are in rough shape from wearing shoes that are a little too loose for my workouts. My feet are starting to crack from wearing flip flops all the time. I could use some major help. Why Do I Want To Win This Product? Dry And Rough Skin On My Feet And Maybe This Product Will Help. Thanks For Having This Giveaway!!!! Our skin is our body's best defense, so it's so important to keep it soft, supple and intact. This would be great to recommend to my diabetic patients. Thanks! I want to win because I have dry cracked skin on my feet. My feet are in a really bad condition right now. I would love to win this prize to try out these products. I would love to win this because my feet have been really dry regrettably! I want to win this for my mother who has the worst dry cracked feet I have ever seen. She always asks me to lotion them and that doesn't seem to help much. Yep, my feet are gross. So dry! I started waitressing at 13 for the family business...my feet are horrible looking!